The desk (similar) and chair are from IKEA. I stained the desk’s legs and love how the little shelves give me easy access to my most-used reference books. To the right of the desk I’ve tucked away a photography lightbox Nathan built for me, as well as a beautiful, vintage Replogle black ocean globe (I’ve always wanted one of these!). This was a Christmas gift from my parents. Nathan and I recently refinished the stand (really pretty walnut), and I love how it turned out. Here are a few of the things on my desktop, including the best candle ever—oatmeal cookie (similar)! I’m trying to keep the desk mostly clear except for the things I use every day. I’m glad Nathan talked me into upsizing to the mid-sized desktop— it’s nice to have the space to spread out. On the main wall I have a mini gallery wall started, including prints of Marc Chagall paintings that we displayed at our wedding, the poster for the 2011 film version of Jane Eyre (Nathan and I saw this at the Chicago premiere), a You Make Everything Beautiful print from Rifle Paper Co., and Starry Night Deconstructed. I plan to add to this as soon as some lovely picture frames I’ve been watching finally go on sale. Behind my desk I have two ceiling-height bookshelves, and a few weeks ago I played around with roughly organizing the books by color. I’m a little late in hopping on this bandwagon, but it’s fun for a change and makes me look at my library in a new way. Finally, to the left of my desk I have my work calendar and another print from Rifle Paper Co. The garland is from Oh Joy for Target and is a good reminder to enjoy every day. Happy April! Thanks for letting me share! 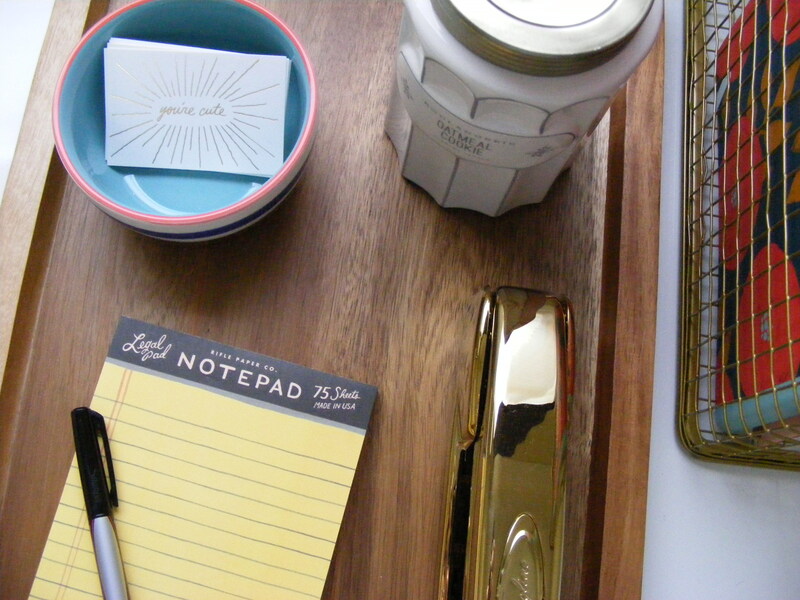 What does your home workspace look like? This entry was posted in books, studio and tagged black ocean globe, books, bookshelves, ceramics, decor, globe, Rifle Paper Co.. Bookmark the permalink. Thanks! 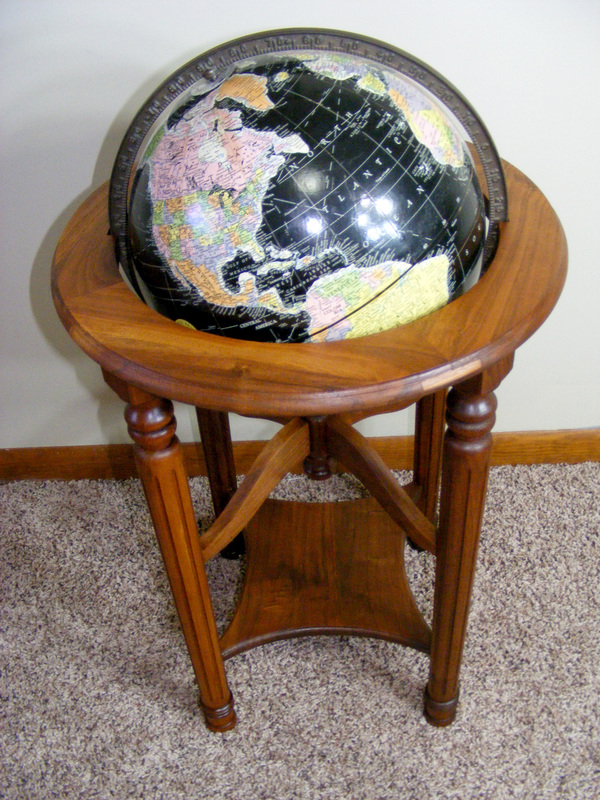 Yes, I think the globe stand turned out great. 🙂 Thanks for finding it for us! It’s a really nice globe. Thanks very much! I wasn’t sure I’d like it either, but it’s been fun to try something different. It made me realize how many books I have with boring black spines–haha! You’re welcome! 🙂 And I saw The Catcher in the Rye on your shelf. Did you like it? I just bought a copy of it today on sale at my local bookstore. I’ve heard that it’s usually a book one either relates to the protagonist or doesn’t and hates it. Oh yeah, it’s really good. I definitely relate to Holden–and I especially did when I first read it in college. The writing style is really interesting and it’s a great book to re-read from time to time. I hope you enjoy it! Maybe you can post a review on your site when you’ve finished it. I love that your blog is devoted to books!